Welcome to Nykoebing F. Katedralskole DOOM, Mission 47 x. This is the official Web-site for this fantastic DOOM-game, which is no more than brilliant. 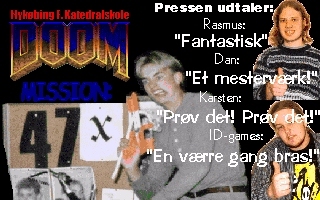 It is a DOOM-level (in fact five DOOM-levels), which takes place on Nykoebing Katedralskole in Denmark, and it is all about walking around and shooting the teachers. Now you shouldn't just sit and think that it is just a couple of lunatics, madmen or DOOM-freaks, who have made these levels. We don't want to be called DOOM-freaks. We have only made these levels, because we thought that it could be fun to see, if it was possible. In fact it is also because we missed an art-project for the school. We have tried to make the school as realistic as possible, and we have for this purpose changed both sounds, graphics and levels. We think that it has become damn good, and so we hope you gamers do. Thus we also believe so. Upon this cost also comes tax and other costs by downloading the game. So if you are not afraid of principal or the police then download the levels in a hurry. Many of the files you can download, include the game, are in zip-format. So if you don't have a program, who can unpacke zip-files, you can download unzip, by clicking on the ,line down under. But the party doesn't stop here, because we have made a little bonus: We have chosen to put a few sounds from the game here. These you can download and listen to a bit of the great game sounds. Or you can get one of our music-files. If you want to know more about the game before downloading it, we have a text-file that explains a little of the game. So now you just miss to download the game beneath...You have to download all three files, if the game must run on you computer. Thats because if you want to make copies of this game, every file is the size of a disk. Look down under to see how you install NykDoom. As said before the files are in zip-format, even that the are selfunpacking files. NykDOOM requires DOOM I installed while NykDOOM II requires DOOM II. Unzip to a temporary folder and and run "install" from the command prompt. Follow the instructions. When the install has ended, you can safely delete the temporary folder. Run "nykdoom" and enjoy. Here follows sersetup.exe og ipxsetup.exe, which allow network play. These are modified to work with NykDOOM. They won't function with normal DOOM / DOOM ][, SO DON'T OVERWRITE THE ORIGINAL FILES, if you still want multiplayer capability of the normal DOOM / DOOM ][. Note. We announce that people with sodosadopaedonekromatokropofagistic tendencies are not allowed to download the game. The updated rules about footsexhandball tell about this. Everybody breaking this rule will be expelled by the in §3 previous mentioned person with the sign on the back.